More than 300 producers, design and engineering professionals, and academics from 30-plus countries who attended the International Concrete Sustainability Conference (ICSC) and 6th North American Conference on Design and Use of Self-Consolidating Concrete (SCC 2016) saw the green building revolution’s profound influence on the past two decades’ most consequential mix technology. ASTM C1798-16 Standard Specification for Returned Fresh Concrete for Use in a New Batch of Ready-Mixed Concrete. NRMCA Senior Vice President, Engineering Colin Lobo outlined processes and protocols in a new Subcommittee C09.40 on Ready-Mixed Concrete standard tailor made for waste reduction and water savings. A five-year effort easing ready mixed producers’ deployment of hydration stabilizing admixtures on returned material, and subsequent use of delayed-set mixes in new orders, culminated with the standard’s December 2015 approval. The document stipulates material volume, time/age and temperature criteria, along with ready mixed customer approvals. Iceland’s Olafur Wallevik: Quantifying the effect of mixer drum revolutions, blade characteristics SCC mix behavior in formwork. “Analysis of Shear Rate Inside a Concrete Mixer Truck.” Reykjavik University Professor Olafur Wallevik discussed a model for gauging the effect of transportation and drum revolutions on SCC mixes’ flowability at point of placement. The model reflects a shear rate analysis performed as a function of different drum charge volume and rotational speed. “Shear rate decreases in a exponential manner with increasing charge volume,” he concludes. If maintaining an effective mixing function is required during concrete transport, he adds, filling the mixer truck drum to half designated capacity or less is recommended—especially if the load is from a transit mixed plant. 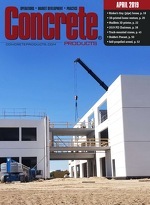 “ Micro-Proportioning of SCC with Crushed Aggregate: Rheology of Filler Modified Cement Pastes” traced an investigation led by Norway’s Rolands Cepuritis, who divides his time between the research & development department of Norcem AS, a HeidelbergCement Group subsidiary, and the Norwegian University of Science and Technology. He and fellow investigators identified the prospects for using vertical shaft impact equipment—common in crushed stone operations—scaled to a ready mixed concrete plant, where it can classify quarry fines uniquely suited to SCC mixes. “Performance of Self-Consolidating Concrete Developed for Iconic and High-Rise Structures in North America.” BASF Construction Chemicals’ Van Bui reflected on the pivotal role of SCC mixes in the United States’ top two reinforced concrete buildings by height: New York City’s 1,396-ft. 432 Park Ave., supplied by Ferrara Bros. and topped out in 2014; and Chicago’s 1,134-ft. Trump International Hotel & Tower, supplied by Prairie Material and topped out in 2007. SCC success in conditions requiring 10,000 psi and higher compressive strengths has BASF testing what he calls ultra high performance SCC. As demonstrated in current engineering schemes, SCC mixes’ modulus characteristics—specified up to 8,000 ksi—are as important to high-rise building assemblies as compressive strengths. Chris Drew: Super and mega tall buildings command much more concrete than steel. “The Role of the Concrete Industry in Reducing the Environmental Impact of the Built Environment.” Christopher Drew, director of Sustainability at Adrian Smith + Gordon Gill Architecture, assessed the prevalence of reinforced concrete in the current generation of super tall (> 300 meter) and mega tall (> 600 meter) buildings. The latter include Jeddah Tower in Saudi Arabia, the largest project under way at his Chicago firm. Engineering schemes calling for all reinforced concrete, or upper-level combinations with composite concrete and steel, are the norm in high-rise buildings—a category once the domain of structural steel. Regardless of project height, Drew stressed the emergence of such green building practice metrics as materials’ embodied carbon dioxide emissions and how project teams are measuring them against buildings’ operating-phase carbon factors. “Successful Marketplace Implementation of Sustainable Ready Mixed Concrete Using Portland-Limestone Cement (PLC).” Holcim (US) Senior Technical Service Engineer Tim Cost tracked wide adoption of PLC and PLC + Class F or Class C fly ash concrete mixes at Mississippi’s MMC Materials. With an eye to a lower clinker factor (i.e. 100 percent portland cement) mixes, the producer has used PLC binder in all types of non-specified and engineered work. The latter include Mississippi State University Davis Wade Stadium expansion; Interstate 55 slip-formed barrier; and, a Florence, Miss., wastewater treatment plant. MMC Materials customers have received the PLC mixes favorably, observing good finishing characteristics for slabs, along with low bleed water tendency in PLC + fly ash mixes. Cost reports additional Mississippi producers turning to PLC binder, along with peer operators in Louisiana and Tennessee, where state agencies have approved portland-limestone powder. Alabama and Arkansas ready mixed producers are working on trial PLC mixes. “Multivariate Analysis of the Fresh State Parameters of Self-Consolidating Concrete.” University of Leeds (United Kingdom) School of Civil Engineering Assistant Professor Dr. Emilio Garcia-Taengua is applying data-mining techniques to a large, literature review-derived body of information on SCC and self-consolidating fiber reinforced concrete mix designs. “We want to reduced the number of trial mixes needed in the industry to see which will behave,” he noted. Dr. Garcia-Taengua and colleagues envision an SCC and SCFRC mix design database enabling: study of the correlations between the parameters that are most commonly used to describe mixes’ fresh state performance; information streamlining to a minimal set of independent variables, and, analysis of the relationships between those variables and mix design parameters. Number crunching has commenced on nearly 200 mix designs indicated in published papers from 2010-2014, with the team pinpointing such parameters as slump-flow test maximum spread; visual segregation index (0 to 3, no to severe); L-box test to measure ratio between heights; V-funnel test flow time; and, J-ring test maximum spread. Database building will continue, ultimately encompassing 700-plus mix designs documented in more than 1,500 papers. “Digital Fabrication and Concrete: Opportunities and Challenges.” Former Sika AG principal scientist and (post-doctoral) Princeton University researcher Robert Flatts discussed an ambitious 3D printing project at ETH Zurich, where he serves as Physical Chemistry of Building Materials professor. Backed by Switzerland’s National Centre of Competence in Research, Smart Dynamic Casting will have he and colleagues testing the feasibility of large scale printing—or layering of tightly controlled mixes—to automate concrete element production. He underscored rheology’s critical role in the build up of mixer layers and avoidance of cold joints. “New Trends in Rheology Driven by Sustainable SCC.” IFSTTAR (France) Senior Researcher Nicolas Roussel referenced strong concentration of ICSC and SCC 2016 presentations focusing on SCC robustness (six sessions) and crushed or recycled aggregates (14 sessions) as indicative of market and practice direction. Market forces will drive a continuing decrease in mixes’ portland cement clinker content and an increase in crushed or recycled aggregate use, he noted, and the latter will require new admixtures to curtail yield stress and control viscosity. As chair of RILEM Technical Committee on Digital Fabrication with Cement-Based Materials, he pointed to SCC improvements central to projects at the University of Southern California and ETH Zurich, respectively: Contour Crafting and (the above-noted) Smart Dynamic Casting. “Smart Casting of Concrete Structures by Active Control of Rheology.” Ghent University (Belgium) Professor Geert de Schutter described a five-year, European Research Council-backed investigation (SmartCast). Scheduled to commence in October 2016, it will target what he described as Active Rheology Control and Active Stiffening Control, each realized through signals directed at mixer trucks, mix-conveying equipment or concrete formwork. Development of signal-based rheology and mix set time adjustments holds much promise for plant and construction site productivity, and attainment of commercial-grade concrete produced through 3D printing methods. “3D Printing Methods and Structural Build-up of Cement-Based Materials.” French researchers Arnaud Perrot, Damien Rangeard and Alexandre Pierre presented an investigation of cement-based materials’ properties in the 3D printing-inspired layer-by-layer building or placing technique. “As construction progresses, the cement-based materials become harder with time,” they write. “The mechanical strength of the cement-based materials must be sufficient to sustain the weight of the layers subsequently deposited. It follows that the comparison of the mechanical strength, which evolves with time (i.e. structural build-up), with the loading due to layers subsequently deposited, can be expected to provide the optimal rate of layer-by-layer construction. “Constructability, Sustainability and Nanoparticles.” Northwestern University Department of Civil and Environmental Engineering Professor Emeritus Dr. Surendra Shah examined the potential for nanoclays—or other silica-bearing, concrete-grade compounds graded at the nano scale—to improve setting time and performance of high volume fly ash concrete mixes; treat recycled aggregates; design highly flowable mixes for potential slip-forming application; and, reduce formwork pressure. A leading SCC and fiber-reinforced concrete authority, Dr. Shah is widely known as Center for Advanced Cement-Based Materials founding director. ACBM encompasses Northwestern, University of Illinois, University of Michigan, and Purdue University engineering departments, plus the National Institute of Standards & Technology. Peers who assisted Dr. Shah in organizing SCC 2016, along with a contingent of past students represented across academia, honored him with themed dinner and conference sessions. This year’s ICSC was the 11th annual staging under NRMCA. Scheduled on a three-year cycle, SCC 2016 was organized by Missouri University of Science & Technology, American Concrete Institute and Paris-based RILEM (International Union of Laboratories and Experts in Construction Materials, Systems and Structures).